Next tour: Mon 26 March 2012. 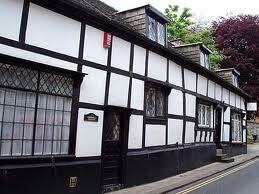 It’s one of the most perfect and picturesque villages in England. Classy Cranford in chi-chi Cheshire is an apt description. 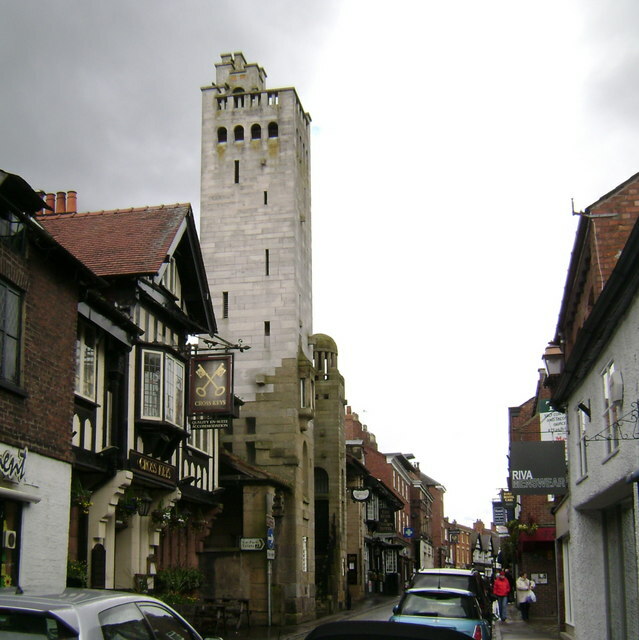 Quaint cafes, romantic churchyards, handsome pubs, dinky shops, groves and Gothic gables, nooks and niches, crevices and crannies line Knutsford. A market town in the Cheshire plain alongside the swooping Tatton Park, charmed with history and a niche in 19th century literature thanks to the Cranford tales of Mrs Gaskell, raised alongside the heath, Knutsford was fortunate enough to attract the attentions of wealthy local glove merchant, Richard Harding Watt, at the beginning of the 20th century. Watt hired the finest local architects – Walter Aston, Harry Fairhurst – to realise his mad vision of Hacienda-styled Moorish mansions and torerean towers in this temperate topography. 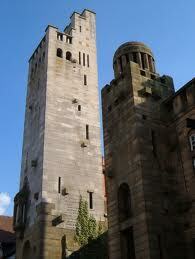 On King Street stands the Gaskell Memorial Tower, one of the world’s greatest follies. It looks like a refugee from a spaghetti western, but it is a recherche sight full of romance, its walls etched with the names of the kings and queens of Britain – of Ethelbert and Aethelred – quotes from Milton, the titles of Mrs Gaskell’s books and classical columns transferred from the demolished infirmary in Manchester’s Piccadilly Gardens and from St Peter’s Church at the other side of the city centre. Watt’s Ruskin Rooms near Tatton Park are as inspired but not as manic. Here the Arts & Crafts language of Mackmurdo and Norman Shaw meets the Italiante irrationality of Portmeirion. Then there are Watt’s mansions on Legh Road which defy belief. This is an extraordinary village, almost unmatchable in this country. No wonder it has attracted the creme de la creme of local society to live here: Henry Royce, Bobby Charlton, Graeme Souness and George Osborne.